Well, the higher than normal daytime highs in February has accelerated the flowering of everything. The almond tree is in full bloom along with the grapefruit tree. The pomegranates have full foliage and the first flowers have been spotted. Many savoy cabbages were harvested this month and many more that will be ready over the next month. The spinach is doing well and providing a steady supply. I harvested the first beets in February and the newly planted turnips are doing very well. I have harvested about 15 small heirloom tomatoes in February from a plant that was planted in a large pot last fall and protected through winter. Typically I would not harvest any garlic planted in October until April or May, but I had about 6 bulbs that were ready in February. Though the bulbs are not huge, the tops indicated that they were ready and sure enough they were, only 5 months after planting. Make sure you harvest your garlic when the tops turn brown. Bees, bees and more bees are taking full advantage of all the blooms from the grapefruit, almond tree, borage, tidy tips, nasturtiums and the poppies. It is good to see the bees out in full force. I planted zucchini, melon, pumpkin, pepper, tomato, mint and eggplant seedlings in February. The first baby pumpkin has been spotted. February Harvest picture - Lacinato Kale, Rouge Romaine, Spinach, Mustard greens, Mizuna, Beets, Savoy Cabbage, Snow Peas, Bell Pepper, Cayenne & Serrano peppers, Nasturtium & Marigold flowers, Cilantro, and Parsley. The snow peas heavily produced in February. The 2nd set of cauliflower seedlings are doing well. The pumpkin seedlings transplanted in February are already flowering. The basil is starting to recover with the warm temperatures. The many volunteer tomato plants are doing great and flowering. The broccoli harvest has been small due to the quick ramp in temperature. Overall high temperatures in February are causing the cilantro and some lettuce to bolt and flower. Some lettuce in the sunnier locations are getting some sunburn damage. The snow peas have really slowed down on production with the unseasonable high temperatures. The higher than normal temperatures in February and bleeding now into March really drive the need to make sure you are keeping your transplants shaded until they adjust and keep the roots cool by using a 4" - 6" mulch cover. I use shredded coconut shells as they seem to take longer to breakdown and do a good job of keeping the soil cool and moist. You may also need to shade the leafy vegetables like lettuce, spinach, chard etc. if they are planted in direct sun areas. The most critical component to keeping your plants healthy and happy as the temperatures rise is mulch. A good layer of mulch conserves moisture, keeps the soil and roots cool and stifles weed growth. It will also provide nutrients as it breaks down. Some types of mulch products are: partially de-composed compost, native tree trimmings (cedar or eucalyptus also help deter bad insects), pine needles, and I use shredded coconut. Stay away from flat pine bark as it may not allow the soil to breath. Also plastic and gravel products do not bio-degrade, so you do not get the added nutrients to the soil. 1. Prune vines and spring flowering shrubs after they finishing blooming. 2. Thin fruit on deciduous trees to 6" spacing. 3. Now is the time to plant new citrus trees (choose trees that are 3 - 5yrs old). 6. Turn the compost pile. 7. Place shade cloth over tomatoes to keep leaf hoppers away. 8. Cut back old and dead growth in the herb garden. 9. Prepare your soil for a spring/summer garden. Organic matter, mulch, manure or compost is very important. 10. Fertilize producing vegetable gardens. 3. Don't fertilize citrus trees if planted within the last 2 years. 4. Don’t forget to keep the weeds in check. • Seeds - Beets, Snap beans, Carrots, Corn, Cucumbers, Jicama, Okra, Green Onions, Pumpkin, Radish, Summer & Winter Squash. • Herbs: Anise, Basil, Bay, Caraway, Calendula, Catnip, Chamomile, Chives, Dill, Epazote, Fennel, Feverfew, French Tarragon, Lavender, Lemon Balm, Lemon grass, Marjoram, Mint, Oregano, Parsley, Rue, Safflower, Sage, Savory, Thyme. • Flowers: Alyssum, Begonias, Chrysanthemum, Coreopsis, Cosmos, Gallardia, Hibiscus, Hollyhock, Marigold, Mirabilis, Petunia, Poppy, Portulaca, Society Garlic, Sunflower, Sweet Pea, Vinca, Zinnia. - Japanese Stir Fry - This can be a main meal or side dish. 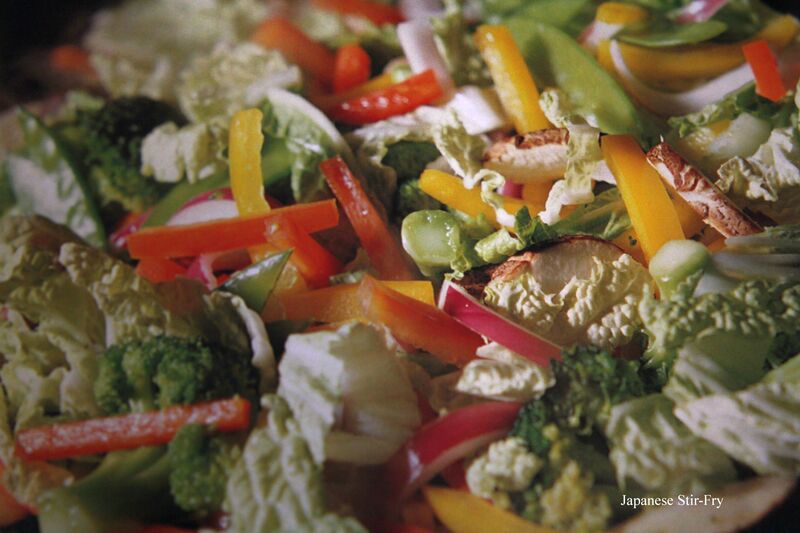 It is timely with the seasonal abundance of broccoli, snow peas, cabbage and peppers. Q: Why should I use organic fertilizer and what is considered an organic fertilizer? A: High doses of synthetic nitrogen fertilizer can cause abnormal spurts of growth that lead to insect and disease problems. Through slow soil building by using organic fertilizers you will reduce risk of these issues. Natural organic fertilizers add humus and carbon to the soil, which is lacking in the Southwest. It is also, almost impossible to burn your plants with too much organic fertilizer as these fertilizers release more slowly. Organic fertilizers encourage beneficial soil organisms and worms and improves soil structure, including aeration and moisture-holding capacity. Organic fertilizers contain carbon and may be natural or man-made. Natural organic fertilizers are derived from decayed remains of living things and have minimal processing like fish and bone meal. Inorganic or synthetic chemical fertilizers are man-made and contain no carbon (organic) elements. Some suggested organic fertilizers are: Alfalfa meal, Blood meal, Bone meal, Soft Phosphate, Composted dairy cow manure, Compost, Cottonseed meal, Coffee grounds, Fish emulsion, Greensand, Liquid Seaweed.